Up until December 2014 the official route of the Norfolk Coast Path from its start at Cromer Pier through to Sheringham navigated inland along the hills of the Cromer Ridge, the highest ground in Norfolk. This original route can still be walked and contrasts with the cliff-top route of the realigned path which is now part of the England Coast Path. 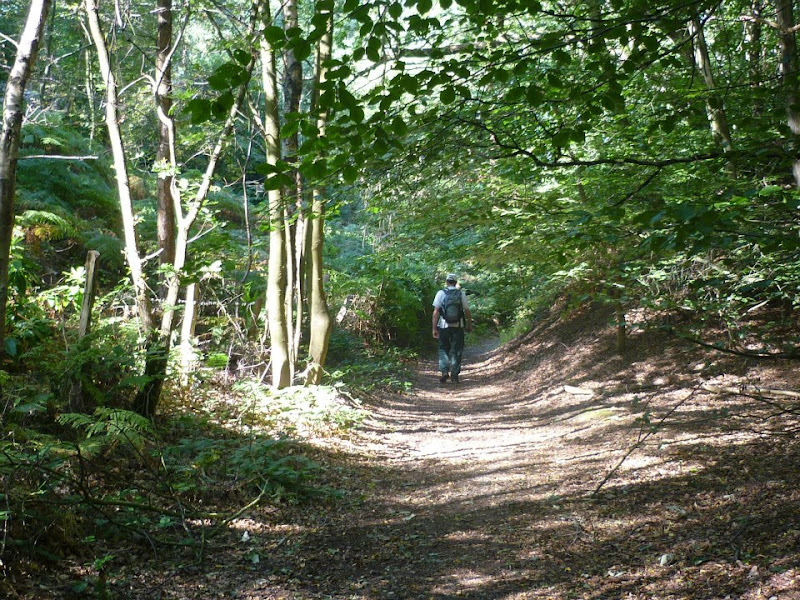 With shady lanes and tracks through the woodland, spectacular views from the summit of Beacon Hill and the challenging ascent to the iconic Beeston Bump, this walk is a worthwhile excursion from the coastal route. Located on the clifftops at East Runton, half way between Sheringham and Cromer, this highly recommended touring site is ideal for exploring North Norfolk with public transport available to many destinations from the entrance to the site. 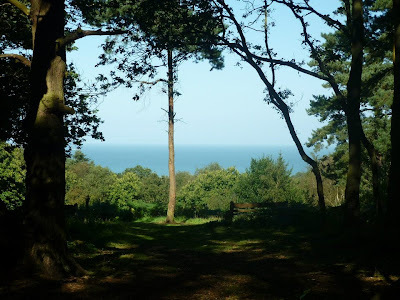 Up until December 2014 the official route to the Norfolk Coast Path between Cromer and Sheringham navigated away from the coast and across the hills that form part of the Cromer Ridge, which is the highest ground in Norfolk. An overview of the initial phase of the Norfolk coast Path extension can be found at the walks overview page of The Norfolk Coast Path Extension. Although new signposts and waymarkers have been added for the section between Cromer and Sheringham, the original waymarkers are still in place and the footpaths and tracks are well maintained making this a worthy alternative to the new official route. Roman Camp, sitting high on the ridge, is a bit of a misnomer as there was never any Roman camp there, maybe some old medieval iron workings but certainly no evidence of Romans. Quite why it was ever named as such I don't fully know, though there are suggestions that it was merely invented to cash in on the early tourist trade. I have fond memories from way back in the 1970's when this area was the setting for frequent family holidays. Back then, there used to be a cafe as the marker for Roman Camp simply named 'Roman Camp Tea Gardens'. And the area was always referred to as plain 'Roman Camp' and never the definitive 'The Roman Camp' although this is how it now appears on modern OS maps. It always intrigued my young curious mind as to why it was referred to as Roman Camp as there certainly appeared to be a distinct lack of Romans and no sign of any encampment. I was certain that it was probably called something else and the adult folk had somehow mistaken its name, or worse still, the dreaded thought that I had completely misheard the pronunciation and it wasn't really Roman Camp that they were saying but a local Norfolk name that I was ignorant of and that would explain the missing 'the' preceding its name. And, if this was the case, I would certainly be ribbed for not knowing its real name if I ever let slip that I thought it was called Roman Camp. The thought was not worth bearing the weight of. I would be taunted with a constant barrage of jokes about there being no Romans and reminders of there being no encampment. Better to keep ones mouth tight lipped and nod and agree that we would head up to Roman Camp, or whatever it may be called, and silently wonder about the lack of Romans, the lack of an encampment and the lack of the word 'The' to its name. Despite my qualms about its name, the enticement of 'Let's go up to Roman Camp' would still be something worth anticipating with the enthusiasm of the slow walk up the hill from one of the Runtons on a hot summers afternoon to be rewarded by a glass of Cresta lemonade with a block of ice cream inserted into it, both items purchased from the Tea Gardens. The Cresta would fizz and froth as the ice cream slowly melted into the liquid, creating a moreish cream soda flavour. Additional entertainment could be had by dive-bombing and dunking the ice cream with the compulsory straw. A relaxing hour would be passed sitting at the parasoled tables in front of the cafe and gathering our energies together for the walk back down to the sea. I would spend the time surveying the surroundings and noting the distinct lack of Romans, keeping tight lipped about my observations just in case it wasn't really called Roman Camp. My thoughts would wander, imagining that maybe one time we would arrive here and we would witness a legion of Roman soldiers setting up camp. Then I could confidently speak up in a firm and confident voice declaring authoritatively 'Look, there are Romans at Roman Camp' and heads would nod affirmatively at my observation. It was only ever daydreams. No Romans showed up in all the times I ever visited. And so I kept my thoughts to myself. Now, some years on, with a little more wisdom and knowledge I know it is called Roman Camp, and not The Roman Camp as depicted on OS Maps. I still don't really know why. Sadly there is no longer a cafe to mark its position, the permanent single storied building now replaced by a somewhat clinical caravan park. And the magic and mystery that I used to know about this place seems somewhat diminished. The walk follows the former coast path route before it was realigned along the cliff top paths. The path starts at Cromer Pier. This was the start of the Norfolk Coast Path up until December 2012 when it was extended as part of the England Coast Path. The Pier is also the start to both The Weavers Way and The Paston Way. Keep to the cliff top walking westwards away from the pier alongside the Cliff Gardens until Beach Road is reached on the left hand side of the road which is easily noticed by the car park on its far side. Follow Beach Road, past Morrisons Supermarket on the right, then turn right onto the main Holt Road. Beyond the commercial complex, take the right into Sandy Road and keep to the track beyond the houses. The route is easy to follow, going under the railway and across a road then along the lane known as Cross Lane. Be sure not to miss the path that leads straight ahead when the lane bears right as this leads down into East Runton. In reality one needs to turn left to keep straight ahead as the track curves onto the Runton Lane first. Continue straight ahead, soon passing a camp site on the right. The path joins a track that leads through the woods and up to the West Runton road. Go directly across the road and onto Roman Camp. There is a clearing here with some magnificent views of the coast. From the camp, bear round to the right and the path starts to descend down the hillside through the woods. This then joins Calves Well Lane for a few hundred yards before descending further down past Hall Farm. When the track meets a small road, turn left and go out onto the main road. Cross over and the road to continue down a lane on the opposite side. Continue across the railway crossing and on to Beeston Bump. Go over the Bump which is a steep climb from the East and then a gentle slope back down the west side. When the path meets a putting Green take the steps on the right down to the promenade which leads into Sheringham. 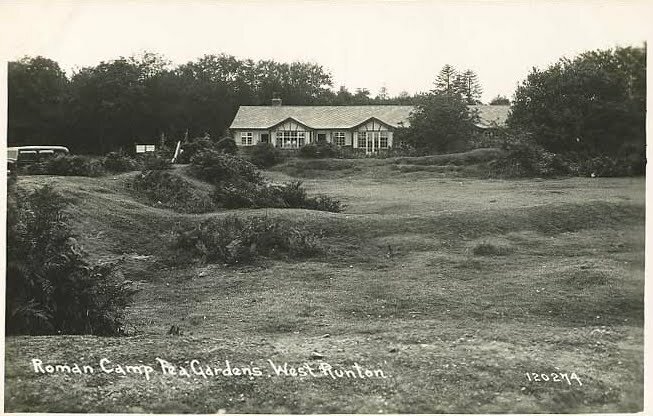 Old postcard of the Roman Camp Tea Gardens, so many memories of sitting in its gardens and drinking fizzy Cresta lemonade with a block of ice cream in it. Only Cresta would suffice, no other lemonade would create the frothy mixture that would ensue! Happy days. The Tea Garden are long gone now replaced by a non-descript and landscaped caravan park. The pub dates from the early 19th century and has variously been referred to as both The Windham Arms and The Wyndham Arms. Its first landlord, Robert Sunman built Sheringham's first lifeboat, the Augusta in 1838. Today the pub is a family run establishment that prides itself on their selection of Norfolk Ales and ciders and has a good reputation for home cooked food with a menu of both Greek and English dishes. There is a cosy olde worlde character with an open fire. A courtyard offers outdoor drinking area. As ever, this pub had a good variety of local ales on offer including examples from Humpty Dumpty, Woodfordes and Winters breweries. It is always a difficult decision to choose when there is such a choice from renowned brewers. On this occasion I opted for some Bees Brewery Amber ale. A good session beer from just down the road at Walcott. Top marks for this mighty fine pub! The summit to Beacon Hill has an earthwork enclosure and was once a coastal signal station and prior to that was the site of a beacon although its exact location is not known. Reports of a watch being kept on this site date back to 1324 and it has been suggested that some kind of beacon may have been deployed at this time. Certainly there was a Beacon by the time of 1608 as there are records of repairs being carried out to the structure, plus later that century the Norfolk Quarter Sessions records funds being raised to maintain both the Beacon and a watch. By the end of the 18th century, maps of Norfolk name the hill as The Old Beacon which would suggest it was no longer in use. The Ordnance Survey map of 1838 calls the site a Signal Station in addition to Black Beacon Hill and it is thought that this was part of a chain of signal stations set up during the Napoleonic wars that linked Devon and Edinburgh, which were abandoned in 1841. By the end of the 19th century the names appearing on maps mention Beacon Hill and Hills and Holes, the area of the suggested iron workings. The name Roman Camp starts to appear in the late 19th century. It's origins are unclear but one suggestion was that it was invented by Cromer carriage drivers to encourage business from visitors by offering them trips to this historic site. There is no evidence of any Roman occupation of the area although it is thought that the many pits that can be seen around the area can be attributed to medieval iron workings dating from the 9th to late 11th centuries. Hollows in the ground around Roman Camp are often referred to as the Hills and Holes or sometimes as The Shrieking Pits This later name has conjured up folktales of ghostly apparitions that are said to haunt the pits. Such tales surround the area from Overstrand in the east right around to Weybourne. Probably the most renowned is at Hungry Hill near Northrepps where the apparition of a young lady is said to cry out from the pit after she took her life following an adulterous affair. To the South of Aylmerton there are stories of a tall phantom woman in white who is said to peer into the pits whilst wringing her hands and moaning or shrieking. The Hills and Holes of Roman Camp commonly have the ghostly young mother looking for her baby after both she and infant were murdered by her husband. When walking the coastline from Cromer to Sheringham or taking the North Norfolk Coast Path through the hills above the towns one cannot fail to notice the hill on the cliffs that shadows Sheringham. Officially known as Beeston Hill but more commonly called Beeston Bump, this 207 feet high hill is part of Cromer Ridge. Beeston Bump was once part of a pair of symmetrical round flat-topped hills that resembled giant molehills. The hill on the northern side was washed away by the sea, with the last evidence disappearing in the 1930's. Beeston Bump is also subject to the continual erosion from wind rain and sea even though the rate has been slowed by groynes and sea walls. Today it is a popular hill for tourists and locals alike to climb on route to Sheringham, with the North Norfolk Coast Path routed over its summit. Spectacular views can be seen from the top with Cromer in the East and Weybourne and Blakeney Point in the west. The summit is marked with a triangulation point and the structural remains of second world war military installations. During the second world war the hill was used to establish a Y-station, these were communications points intent of both Interception and Direction Finding of the enemies signals. This data was then sent to Bletchley Park in Bucks for decoding. The remains of this top secret facility can still be seen on the summit of the hill and consist of an octagonal concrete base with a channel ingraved from east to west. . This originally supported the station operators hut which was a double skinned wooden structure with the cavity filled with shingle to provide protection from bullets.